구글은 자사의 공식 블로그(http://googleblog.blogspot.com/)를 통해, 구글 OS로 구동되는 스마트폰 및 태블릿 PC 용 유/무료 앱의 누적 다운로드 규모가 100억 건을 넘어섰으며, 7월 이후에는 매월 약 10억 건씩 증가하고 있다고 발표하였습니다. 구글은 이를 기념해 인기 유로 앱을 10센트에 제공할 것이라고 하였구요, 안드로이드 마켓의 경쟁자인 애플의 앱스토어의 경우 지난 1월 100억 건을 돌파 했으며, 7월에 150억 건을 돌파했으나 증가속도는 둔화되고 있습니다. 특이하게 한쿡이 제일 많은 다운로드 횟수를 나타내고 있는데요, 무료+광고 버전이 한쿡에서 의미가 있을 것 같습니다. 자세한 건 아래를 참고해 주시기 바랍니다. 다운로드 된 앱의 종류는 역시 게임 관련 앱이 25.5%를 차지해 가장 높은 인기를 얻고 있는 것으로 나타났으며 2위는 엔터테인먼트 관련 앱(12.2%), 3위는 각종 툴 관련 앱(11.2%)이 차지했으며, 음악(4.3%), SNS(4.1%), 미디어(3.7%), 여행관련 앱(3.6%) 등은 낮은 순위 기록하였습니다. 참고로 안드로이드 마켓은 전 세계 190개국에서 이용되고 있으며, 이용자들이 다운로드를 가장 많이 하는 시간은 일요일 저녁 9시, 가장 다운로드가 적은 시간은 월요일 새벽 4시로 나타났습니다. 일요일에 정점을 찍고 월요일부터 다시 수치가 올라가는 것 같네요..
One billion is a pretty big number by any measurement. However, when it’s describing the speed at which something is growing, it’s simply amazing. This past weekend, thanks to Android users around the world, Android Market exceeded 10 billion app downloads—with a growth rate of one billion app downloads per month. 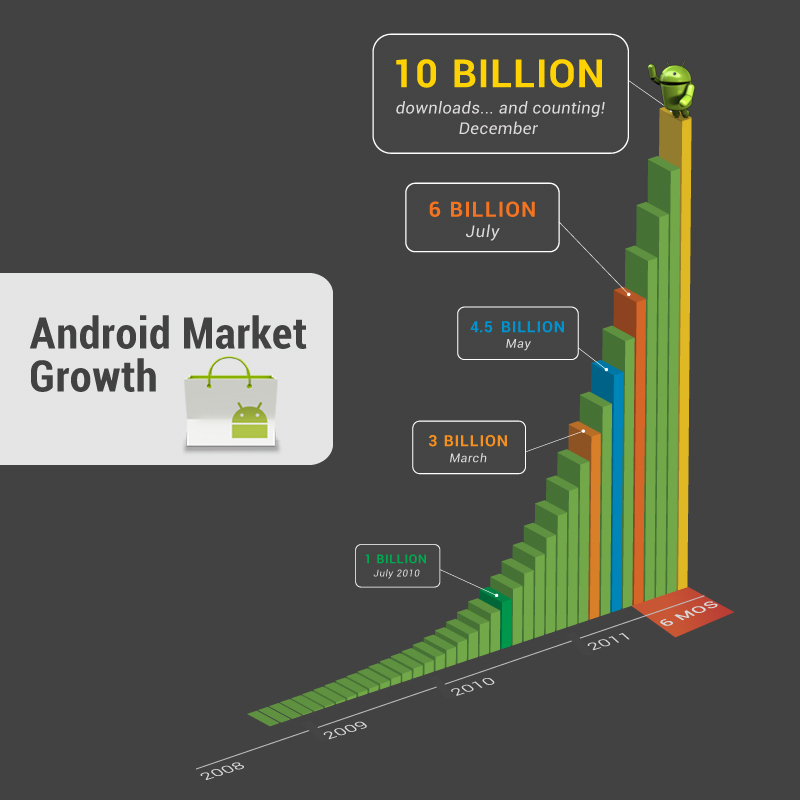 We can’t wait to see where this accelerating growth takes us in 2012. To celebrate this milestone, we partnered with some of the Android developers who contributed to this milestone to make a bunch of great Android apps available at an amazing price. Starting today for the next 10 days, we’ll have a new set of awesome apps available each day for only 10 cents each. Today, we are starting with Asphalt 6 HD, Color & Draw for Kids, Endomondo Sports Tracker Pro, Fieldrunners HD, Great Little War Game, Minecraft, Paper Camera, Sketchbook Mobile, Soundhound Infinity and SwiftKey X. Of course, none of these apps would have existed if it weren’t for the developers who created them. Every day, these developers continue to push the limits on what’s possible and delight us in the process. For that, we thank them. Please join us in this 10-day celebration and check in every day to see what new apps our developer partners are making available on Android Market—for only a dime.